Upcoming Events~ mark your calendars! Mid-January already. My waders have been wet twice. Nothing to prove my fishing success rate, except for the fulfillment and peace of mind a walk in the woods with waders on provides. Things are happening and my agenda is filling quickly. I wanted to post up events that are happening locally and around the state that you as well as myself can get a grip on the season before it is late May and we wonder where it all went. First off, Next weekend. January 26, 2013. Boyne City has a Winter Festival with many activities including a Chili cook-off, Wine Tasting, a Scavenger Hunt and a Snowman Sculpting contest. Myself and others from the Miller Van Winkle Chapter of TU will tying flies and telling lies at The Freshwater Studio on Lake St. celebrating “Cabin Fever Fly Tying”. Alex Wolff will be on hand with his handmade bamboo fly rods and he shall once again convince me to take one of his custom 3-weights out for a test drive on the Jordan River this summer. February has the F3T Tour coming to town on the 9th at 7:00 pm at Boyne Mountain Grand Lodge. Last year the event brought out a few local anglers, this season the crew at Boyne Outfitters hope a few Snowbunnies come in from the slopes to enjoy some select trailers from Fly Fishing Films yet to be released. As always, the sponsors of the F3T throw in a few great door prizes, so be sure to buy your tickets and show up early to get a good seat. All winter long the Boyne Outfitters is offereing Fly Tying classes twice a week. On wednesdays you can have the pleasure of tying with Jason Tucker of Fontinalis Rising fame and Thursday nights ‘Beer & Bugs’ theme tying night in Everett’s lounge. Both nights are at 7:00pm and require a positive attitude, a touch of skill and a healthy dose of sarcasm if you tie with JT. March, April and May are booking very fast between Stream monitoring with Tip of The Mitt, Salmon in the Classroom, MVWTU Children’s Clinic at Oden State Fish Hatchery, and TU banquets across the state, I only hope I can squeeze a little water therapy in between for myself and family. Camp Daggett hosts a Father & Son weekend that MVWTU has volunteered for the past four years teaching fly tying and Fly Casting to some individuals who might otherwise never be exposed to our world of fun. 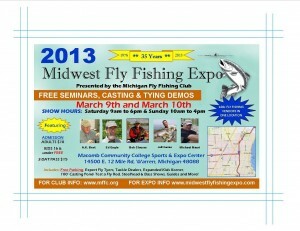 The only downside is, it always coincides with the Midwest Fly Expo in Warren Michigan on March 9 & 10. 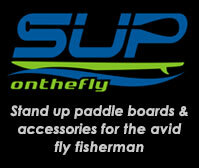 This event has some of the biggest names in the fly fishing industry this region ever gets to see. Names like A.K. Best, Jeff Currier, Bob Clouser, Don Engle and the list goes on. I hope to make it down state to meet and greet with some of the great people that will be down there, but time, distance and weather often make it difficult. The students at Sheridan Elementary will be releasing the salmon they have raised since last November on May 3, what an awesome experience I am very happy to be a part of. 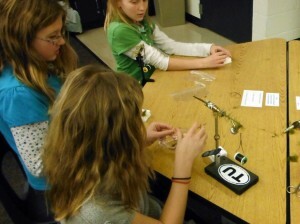 Last week I went in and taught twenty some 4th & 5th graders how to tie their first fly, with the assistance of Mike Cherry and Steve Radecki from our TU chapter. Some have asked why we go in each month and take an active role with the SIC students and I recently received a letter from their teacher- Mrs. Slack, which sums it up pretty well. “I just got off the phone with a parent. She giggled as she told me that her daughter, Madeline, spent all day on Saturday tying flies with her sister. Her dad has all of the stuff and the girls went to town making and naming over 20 flies! They are addicted. I am going to have her bring them in when you come next. I think that is good enough reason. April 13, 2013 The Mershon Chapter of TU is hosting and banquet and celebrating Fifty Years of Conservation in the Saginaw/Thumb Area. I hope you have a chance to say hello to Jac Ford and the rest of the awesome crew down there! There seem to be a myriad of other events headed our way, I hope by sharing a few of these, it will give you an idea or two for something to do. Before you know it, we will be knee deep on a cool bend watching for Hendrickson’s to come pouring off the water….